The symbolic meaning of Horse . . .
"The symbolism of Horse shows us a majestic and magical animal, holding wisdom and messages spoken telepathically ~ she feels your energy, she senses your nature, you must earn her trust, when you do she will take to far away places... lands of enchantment, wonder and awe." Victorious spirit and the symbolism of the Horse..... Horse is regal and fierce in competition, running her heart out to beat out her competitors to be the one to take first place, to have the crown of glory. The Horse is a totem with the heart of a legendary competitor. Watch any race horse and you will see her true nature shining through to be victorious, to walk beside the Goddess Nike ~ the Goddess of Victory with her head held high draped in roses... donning the prance of a celebrated champion. She knows when she has been victorious, and she claims her power and victory with distinguished honor. To this day I can't watch the Kentucky Derby, the most famous of all horse races without tearing up. There's just something that moves me to the depths to watch these majestic animals ride as hard and fast as they possibly can, giving everything they have. ~~> Another very popular totem animal with telepathic prowess is the Wolf! Of the symbolic meaning of Horse, Ted Andrews says, "No single animal has contributed more to the spread of civilization than the horse.Horse brings with it new journeys. It will teach you to ride into new directions to awaken and discover your own freedom and power". Crazy Good Music on this Video!! 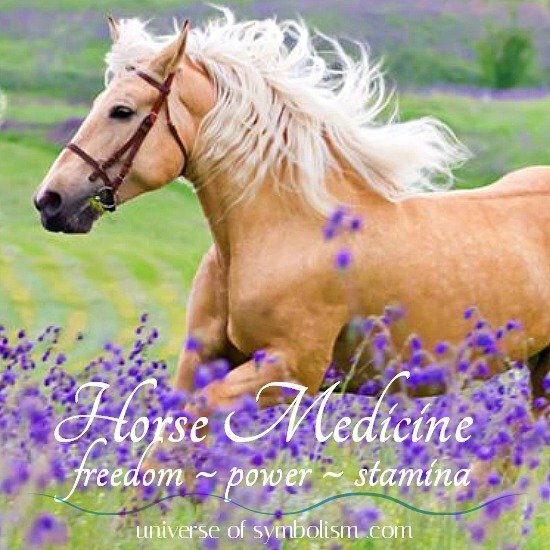 The symbolic meaning of Horse as a spirit animal is all about power ~ think "horse-power" ~ the Horse exemplifies being tuned for maximum personal power. The Horse naturally conveys the message that she is strong and determined, confident and graceful, in all that she does, it is her spiritual essence, and we are drawn to her... captivated by her mystical charms. Horse spirit animal carries herself with a sense of knowing and deep mystery. Horse has the ability to take you through terrain, you could not traverse alone ~ mountain tops, valleys and across the water. 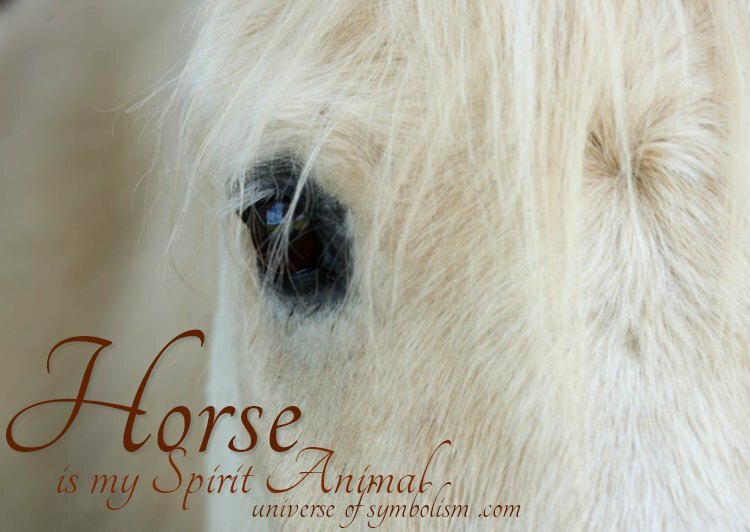 Horse spirit animal guide is of the wind ~ free in spirit. What is the spiritual meaning of Horses? The spiritual meaning of Horse conveys to us that she is so very mystical as to appear and disappear in the trees, looking at you across a field you can feel she knows you and has a wisdom message for your Spirit self. Horse magic can carry you to your destiny ~ knowing the hidden and secret passages. Horse totem is so magical as to become the Pegasus or the Unicorn in the twinkling of an eye. The symbolic meaning of Horse unfolds into new dimensions and realms, layers of mysteries yet uncharted. It is your destiny to find what awaits for you among the hidden and secret passages. The symbolic meaning of Horse as your totem animal shines light upon the sacred bonds that are created between man/woman and horse. Horse totem animal has been a friend and a companion to man and woman for thousands of years, without the horse fantastic explorations and epic journeys across continents simply stated ~ could not have been made. Horse has been a warrior mate, a journey mate and a discovery mate venturing into new lands together for millennia. Although he has been a companion and friend to man and woman, what Horse loves most of all is to run free and wild... untamed. This is the true Spirit of Horse... Freedom. Freedom is the most sacred of symbolic meanings of what it is to be the Horse. Freedom in every sense of the word; mind body and spirit. Call upon the Horse spirit animal to set your spirit free. Wild Horses are called Mustangs; they symbolize ultimate freedom, traversing the lands wild and free with the wind in their hair, completely in the moment of now, yesterday gone forever and tomorrow an eternity away. The Rolling Stones song "Wild Horses", is one of the most beautiful love songs ever penned, and to this day is perhaps my favorite song of all time. Call on the enchantment of the Horse when you desire her totem powers, gifts and medicine ~ she will carry you through the mists of Avalon on an adventure you will never forget. Horse spirit animal has amazing memory, once the Horse learns something... she never forgets! 50 million years ago the Horse roamed earth and was the size of a Cocker Spaniel! As it was bred for size and strength, it evolved and grew to become the Horse we know and love today. The beautiful symbolic meanings of Horse hold many enchanted offerings... Once again I hear Horse Spirit whispering in the winds reminding us of it's very powerful medicine ~ echoing are the words Power and Presence, Elegance and Strength ~ I am that I am..... I AM Horse. Horse has the spirit of freedom and of a warrior, when you dream of the Horse you may be tapping into a subconscious desire to be free of something, and you may need to fight for the freedom you want, with the spirit of a wild horse. Dreaming of the Horse can mean that you have an upcoming journey ~ or move. In this way the dream of the Horse represents the nomad within. Symbolic meaning of Horse in dreams can also represent triumph of a goal that you have been working for ~ when a Horse is draped in roses in grand ceremony, this represents celebration and accomplishment, recognition and the goal reaching it's zenith. The female Horse is called a mare, the male horse a stallion, a young horse is called a pony and a baby horse is called a foal. Symbolism of a White Horse ~ A white horse is symbolic of being a hero, as pure as the driven snow, and being vulnerable. A valiant knight always rides the white horse. The unicorn is always depicted as being white as well. Symbolism of a Black Horse ~ A black horse is a symbol of mystery and intrigue. A black horse symbolizes power, independence, sexual allure and a strong sense of self. Symbolism of a Painted Pony ~ A painted pony has beautiful markings which look almost painted, typically white and brown or gray. Symbolic of a free spirit, imagination,running wild and being carefree. Symbolism of a Race Horse ~ A race horse is symbolic of being the best of the best, bred to be a thoroughbred, bred from previous champions, a race horse has the lust and passion to be the best, to be the fastest, to be the champion. A race horse is refined in every way, possessing elegance, poise and presence and strength. Symbolism of a Stallion ~ The Stallion exudes sexual energy and confidence, alpha male and proud of it, the Stallion has a commanding presence to all that encounters it. A Horse Shoe Meaning ~ is an enduring symbol of good luck. A Horse with a single spiraled horn is a Unicorn.